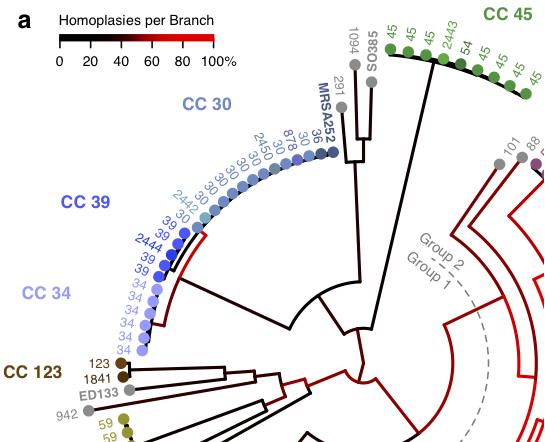 This week published in Nature Communications we have a new open access paper looking at what drives variability in rates of recombination (horizontal gene transfer, HGT) in the core genome of Staphylococcus aureus. HGT in the core genome is important for eliminating harmful mutations and promoting the spread of beneficial mutations, such as those that make the bacteria resistant to antibiotics. Compared to recent work focusing on individual, highly-related strains of S. aureus, we found much higher rates of core HGT across the species as a whole. We saw that the frequency of HGT varies along the genome. At broad scales, core HGT is higher near the origin of replication, a pattern reminiscent of the one described by Eduardo Rocha and colleagues in E. coli, who hypothesized that the over-abundance of DNA near the origin during rapid growth could promote HGT. At fine scales, we found more frequent HGT in regions of the core genome close to mobile elements. The hottest regions occurred near mobile regions called ICE6013, SCC and genomic island α. The insertion and excision of mobile elements from the genome represents a type of HGT, so our finding that nearby core regions also experience more HGT suggests there is some sort of "spill over". This idea is supported by work in Ashley Robinson's group that found similarities between ICE6013 and a class of mobile elements in Streptococcus agalactiae called TnGBS2. TnGBS2 was discovered by Phillipe Glaser's lab who showed it sometimes transfers large tracts of adjacent core material during conjugation. Whether conjugation alone can explain the high levels of core HGT we saw in S. aureus is unclear - our results suggest there is detectable HGT even in core regions far from mobile elements. Transformation is another possible mechanism of core HGT, but S. aureus is generally thought to be naturally incapable of transformation. However, intriguing work published by Tarek Msadek and colleagues in 2012 indicates there may be cryptic mechanisms of transformation in S. aureus after all. It remains to be seen whether the relative contributions of transformation, transduction and conjugation to the long-term evolution of S. aureus can be disentangled.